Subject: Beautiful in a way I couldn't have imagined. 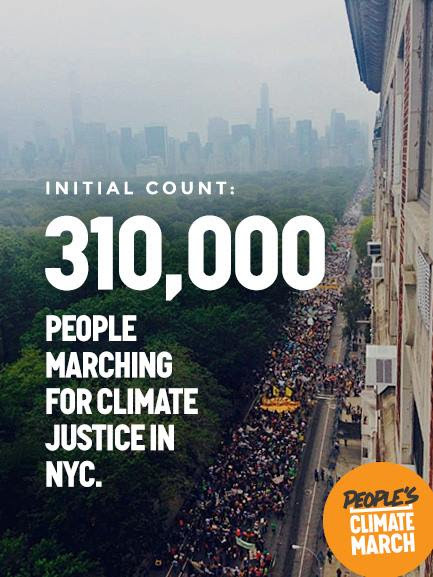 Today, 310,000 people took to the streets of New York City to call for climate action -- the largest climate march in history. And we were joined by hundreds of thousands of others around the world at over 2646 events in 156 countries. And on Tuesday, the world’s politicians will gather in New York to talk about climate action -- 125 heads of state in total. They’ll be gathering with the knowledge that more people than ever are demanding action, not just words, and that their political future is on the line -- as well as the future of the planet. We will bring that message to the top leadership of the UN inside Tuesday’s summit, with a hand-delivered message to top UN climate negotiators. Today people from the communities where fossil fuels are dug up marched alongside people who live where they are burned. Thousands of workers, the people who stand ready to build a clean, renewable energy system, walked alongside indigenous communities that are already leading with their own climate solutions. New Yorkers, including those whose homes were wrecked by Superstorm Sandy, marched in huge numbers, standing alongside international ambassadors from communities responding to climate disasters worldwide. Organizing a big march is like throwing a rock in a pond: the splash is exciting, but the real beauty is in the ripples. And the ripples of the People’s Climate Mobilization are already spreading. A people’s summit outlining the path to a just transition away from fossil fuels starts tomorrow, along with actions targeting corporate polluters in New York. With your help those ripples can spread further, and strengthen -- and on Tuesday, hopefully help rock world leaders into action, where they have only offered words before. I want you to take a moment to appreciate the importance of what happened today. We are mobilizing at the scale that science and justice demand, and it is beautiful in a way we could not have imagined. Now our work continues -- and nothing will be the same.